Did you know you could get some tax relief on your property if you’re a homeowner in the District or Maryland? (Unfortunately, Virginia doesn’t have any property tax reductions like DC and Maryland). 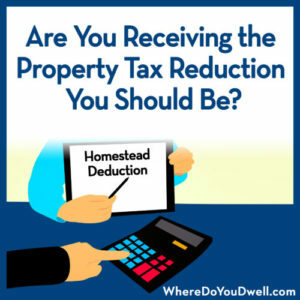 DC’s Homestead Deduction reduces your real property’s assessed value by $72,450 prior to computing the yearly tax liability. That ends up saving you a little over $600 per year on your property taxes! In addition, there is a cap on how high your property tax bill can jump from year to year if you are a homeowner occupant. That’s why you see the property taxes so drastically different in the same neighborhood on listings—if a homeowner has lived in the property for a long time, their taxes are lower and you will have the same benefit if you stay in the home for a long time too. Typically you apply at settlement. However, check your recent tax bill (about half-way down page) to see if it says you are receiving the Homestead Deduction. Once you apply for the first time, you don’t need to apply again. If your approved application is filed from October 1 to March 31, the property will receive the deduction for the entire tax year (and for all tax years in the future). If a properly completed and approved application is filed from April 1 to September 30, the property will receive one-half of the deduction reflected on the second installment (and full deductions for all tax years in the future). If you are an owner occupant in DC and are not receiving this great benefit, get your application here or contact the Office of Tax and Revenue at (202) 727-4TAX (727-4829). For more information about this program, visit the DC government website here. Maryland’s Homestead Tax Credit doesn’t reduce your assessed value but requires local jurisdictions to limit taxable assessment increases to 10% or less each year. That means you don’t have to pay property taxes on the market value increase if it’s above the limit. The tax credit will be granted if the following conditions are met during the previous tax year. Must be the owner’s principal residence and the owner must have lived in it for at least six months of the year, including July 1 of the year for which the credit is applicable, unless the owner was temporarily unable to do so by reason of illness or need of special care. An owner can receive a credit only on one property—the principal residence. All homeowners must submit a one-time application to establish eligibility for the credit. You can access an application here. For more information on this program, visit Maryland’s website on taxation and assessment here. If you live in DC or Maryland, be sure you are receiving these important property tax savings!